Here’s the good news: instead of letting Kepler go gently into the night, NASA will try to fix it in mid- to late-July. NASA’s engineering team is currently running some tests it developed for use in the recovery at Ball Aerospace Facility. Currently, Kepler’s in “point rest” state. I guess you could say that’s akin to a cosmic coma. If they don’t fix it, they’ll continue analyzing the data the telescope harvested when it was operational, which could take a few more years. The wheel problem wouldn’t prevent its data from being relayed back to Earth. 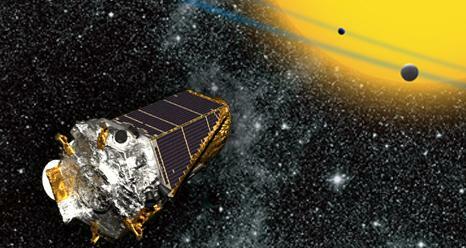 So far, Kepler has spotted 134 habitable planets and another 3,277 candidate planets. Kepler finds planets with a photometer, which measures the brightness of stars — in fact, it can measure the luminosity of 100,000 stars at the same time, for years on end (well, provided the telescope stays healthy). Kepler is solar-powered, but never points at the Sun. As it monitors stars, Kepler notes any decreases in a star’s brightness, which could indicate the transit of a planet in front of it. 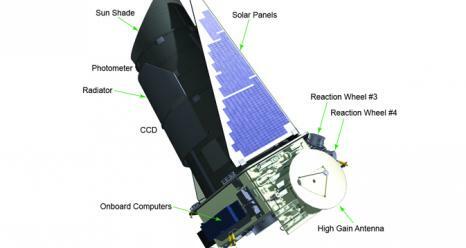 Kepler transmits data back to Mission Control at NASA’s Ames Research Center in California, where the star’s brightness is graphed as a light curve. Dips in the curve that recur in a pattern likely indicate a new planet. The recovery mission involves getting at least one of the two failed wheels operational again, though scientists acknowledge the possibility that it won’t work. If it doesn’t, Kepler will get a new job that doesn’t involve fixed pointing. On the upside, perhaps Kepler would become more socially popular if it stopped pointing?